Four sides of chewing fun for your bird. This is the perfect size bird toy for the shyer player. 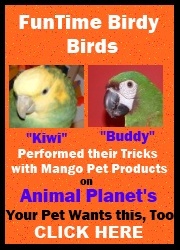 This toy measures 9" Long by 5" Wide so it is just the right size for your feathered friend to grow accustom to. The Birdy Cubed contains wood chews, FunLand Characters and Dinos all fastened to a 5" Wooden base with our bird safe Poly Rope. Bird Toy also contains Tropical tubes. Birdy Cubed African Grey/Amazon Bird Toy5Mark K.March 9, 2018My African Grey likes approaching it from all angles and batting it around. Birdy Cubed African Grey/Amazon Bird Toy5Kristen KeithAugust 23, 2015My African Grey, Casanova Valentino, was lucky enough to win a contest and he had a choice of bird toys to choose from. Nova chose this Birdy Cubed Toy and could not have made a better choice. He has absolutely loved this toy. Being an African Grey, every new thing is rather daunting, but this toy he took to immediately. We decided to hang it on the side of his cage and it is a favorite standing place. He loves the plastic parts of the toy. Plastic is a big time favorite. He is not a wood chewer by any definition, but he really took to the wooden parts of this toy as well. There are many "nibbles" on various parts of the wood. Honestly the first wood pieces that he has chewed on since becoming a member of our family. Overall a fantastic toy for my absolutely spoiled African Grey. Birdy Cubed African Grey/Amazon Bird Toy5DaliJuly 7, 2013Fun toy to hang and climb on! Birdy Cubed African Grey/Amazon Bird Toy5Helana CichonMay 31, 2013At first, BooBoo looked at this large toy with suspicion - after all, it was four times larger than any other hanging toy she'd seen. Within a couple of days, however, she was having fun with it - fighting with it, chewing on it. Bantu, on the other hand, would interact with it only when it was in her paper bag! It kept my birds occupied for days. Birdy Cubed African Grey/Amazon Bird Toy5Meg LDecember 29, 2012Although my CAG, Katie, spends most of her time on a play stand, I put this toy in her cage for her alone time. She's nibbling on each part and likes to swing it back and forth. Birdy Cubed African Grey/Amazon Bird Toy5JoAnn WheelerJuly 4, 2012This one didn't last long he loved it.....he devoured this toy as soon as he got it. Birdy Cubed African Grey/Amazon Bird Toy5ken goinsJune 25, 2012Birds are very pleased with toy. Birdy Cubed African Grey/Amazon Bird Toy5Mom from NYJune 18, 2012My Grey loves this toy, he really enjoys pulling it apart. Birdy Cubed African Grey/Amazon Bird Toy5Gail PiperOctober 23, 2011My DYH Amazon, Haley, loves this -- it is made up of the same foot toys I've been giving her (from FunTime Birdy) so there was no initial fear or caution involved. I hung it in her cage, she recognized the parts and just dug right into it. She has a lot of the wooden pieces chewed apart already and is enjoying the plastic toys a lot. Birdy Cubed African Grey/Amazon Bird Toy5Vicki LeClaireOctober 18, 2011We have a rescue Orange-wing Amazon that despite his rough past, does not believe that beggars have to be choosers when it comes to toys. He turns down even the most expensive toys, but this one passed the test. We will be ordering more! Thank you! Birdy Cubed African Grey/Amazon Bird Toy5NormanMay 29, 2011I loved this bird toy. Took me awhile to finish it off, but I worked at it pretty hard until I got down to the strings! Then Jan restrung it again with leftovers from the toy box and I had another new toy! Love it.... and great price too!